Welcome to Collection of Games number 10. This round, we've got one game on Wednesday, then two each on Saturday and Sunday. "But wait," you say, "that seems to add up to five matches!" "But how can nine teams play five matches?" McCall Zerboni, please report to the USWNT immediately. Sorry Courage. What Happened in COG 9? So many games, it's hard to remember them all. 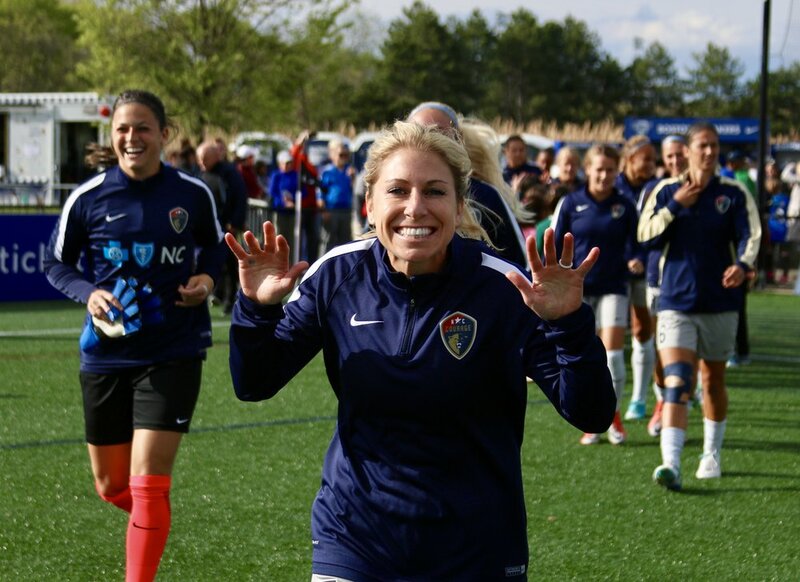 On Wednesday last, The Courage, Spirit and Dash won their games against Orlando, Sky Blue and Seattle, respectively. Yes, the Dash beat the Reign. On Friday night, Utah was blanked 0-2 in Portland. Saturday saw the Pride catch fire and pummel the Red Stars 5-2 in Chicago. Later, the Reign shook off their mini-slump and helped Sky Blue remain winless by taking all the points home on a 1-0 result. Sunday delivered some fireworks in Texas, where the Dash won 3-2 over the Spirit. They'll be happy with the win, but there was a downside to the victory; Houston unfortunately lost Kristie Mewis for the season with a knee injury. Mewis had been looking as good as she ever has in the NWSL, so it's a loss for everyone who loves good football. Heal up Kristie! Emily Sonnett is still out for the Thorns, who have been looking better over the past couple of games. They finally gave some real minutes to Angela Salem last Friday, and, shockingly, it allowed the attacking players to attack while she collected and cleaned up anything that got past them. There is so much talent on the Thorns roster, but not everyone is good at everything (nor should they be). When you've got four or five players who are best deployed on attack, it's not a bonus to have all of them simultaneously on the field with one of them sitting back on defense. It's a liability. A look at the 2-3-3 start should provide ample proof of that. I feel like there is some famous saying about defense and championships that might be relevant here. The Courage land in Portland on the heels of their eighth win. They haven't lost a meaningful match since the NWSL Championship game on October 14, 2017. Remember 2017? The Courage do. They're trying to avoid building up to a let down in another final, and they're well on their way to the best winning record the league has seen. They'll be without Denise O'Sullivan on Wednesday night due to an excused absence, and Jalene Hinkle is listed as questionable with a right calf strain. Following Wednesday's matchup, they'll head to Houston for what should have been the Mewis Derby (say, "Mewie Darbie" and keep calm, or something). But that's not going to happen. However, it may make a difference for how the Courage pick their rosters for the two games. Sunday's match in Houston will be at 7PM Eastern, which I think is locally called the "Blazing Melt Your Face Off Hour." So, fun times. For some reason, I'm feeling a draw here. Won't surprise me if either team finds a way to grab a winner, but let's go with a draw. Welcome to the dark days of international camp. The Red Stars lose Ertz, Huerta and Naeher to the USWNT, while the Spirit somehow only lose Frannie Ordega to her Nigerian squad. None of the many talented American women on the Spirit were called up for this camp and pair of friendlies, which is OK for a few of them, but not great news for Mallory Pugh. She's out this weekend due to right knee swelling even without being called up. It's hard to know what to expect here. Both sides have had a rough run; Chicago is winless since April 18th and though the Spirit won just two weeks back, it was against lowly Sky Blue. Still, without Pugh and Ordega, and with Huster questionable with groin soreness, the Spirit are likely to find it difficult to produce a ton of offense. Outside of the two they'll be without, only Hatch, Banini and Lohman have put balls in nets for Washington this year. Chicago isn't in quite such dire straits, and they played without Ertz for most of the beginning of the season when they were getting better results. (No, do not read that as a suggestion that they're better without her.) I think they'll find a way to get Sam Kerr into space and possibly let Rosie White get in on the attack as well. They're the better side, whether or not they can grab a win. Hmmm. Could this be the game that nets Sky Blue their first win? International absences are large: Sauerbrunn, Rodriguez and Smith for the Royals, and Carli Lloyd and Savannah McCaskill for Sky Blue. The home side will also be without Skroski, and Rodriguez is questionable due to back spasms. Kelley O'Hara remains sidelined for club and country on her right hamstring strain. That's going to make for some interesting matchups, and a few interesting choices for the starting XI on both teams. Utah's back will be tested, but they've got Nicole Barnhart ready to step between the pipes. There's not much she hasn't seen over the years, and Utah won't lack confidence in her ability to stop what gets past the space typically occupied by Broon. Even missing their US internationals, Utah just seems stronger. Sky Blue will have to wait to win another day. The full-strenth Courage just trounced the Portland Thorns on Wednesday, but on Sunday they'll be without Dahlkemper, Dunn, Mathias, Mewis and Zerboni on USWNT duty, and O'Sullivan on Ireland duty. And, Hamilton, Hinkle and Williams are all questionable. Yikes. Sunday's Courage side will look very different. The Dash lost Kristie Mewis for the year when she sprained her left ACL, but they won't be missing any other players to international duty and only list Kyah Simon as questionable this week with a right groin strain. I don't know how the Dash will compensate for Mewis' absence, but that's a lot easier question to answer than the riddle Paul Riley will have to solve replace five or six regular starters and potentially three more important other players. The replacement players they've signed will be eager to make an impression, and Yuri Kawamura is fit again after rehabbing her ACL and meniscus tear suffered on June 2nd last year. But that's a LOT of change in the lineup. Maybe June 3rd will bring better luck? I could see the Courage finding a way to score a few here, but Houston has looked dangerous and I think they're able to take advantage of the circumstances and hand the Courage their first loss of the year. Everyone will know it comes with an asterisk, but points are points. Sunday night's clash won't feature Alex Morgan or Megan Rapinoe. Allie Long and Ashlyn Harris will be far far away. Steph Catley's still questionable with that groin strain from the other day. Oyster's knee remains sprained, and Monica's is still sore; It's almost like we won't recognize these two teams anymore! Worse still for the Pride (as they face 6 sad weeks); their sharp defender Krieger has sprained her right knee. "But Wait!" I exclaim, "There's worse news to come!" The legendary Marta has also hurt herself! Despite all the training and stretching and song, her gimpy left calf will keep her too on the shelf. She won't be alone, as beside her will sit Rachel Hill as she waits for her groin a return to play to permit. I think I've stretched that awful rhyming as far as I can, now I'm back off to the MassDems convention to hang with Elizabeth Warren. But quickly my pick I think you can guess, the Reign win this one with a goal from Yanez.